I remember reading, likely on Facebook, that Green & Blacks has stopped producing their caramel bars. I was kind of disappointed because, sea salt caramel fan though I am, there are times I enjoy a bit of a sweeter treat. I was then surprised when Divine created one as, while there was a gap in the marketplace, I had assumed it was a numbers thing for Green & Blacks and so maybe caramel didn’t make the grade. Caramel is the basis for sea salt caramel, the latest trend as it were. It’s been around for ages but gradually has been adopted by more and more chocolatiers as a filling of choice. That doesn’t make plain old caramel wrong, just different. When caramel is executed well, it is awesome but it is also really easy to get wrong. This divine chocolate bar is just divine 😉 With the balanced sweetness of the milk chocolate and the absolutely buttery smooth caramel, each square is a piece of heaven. 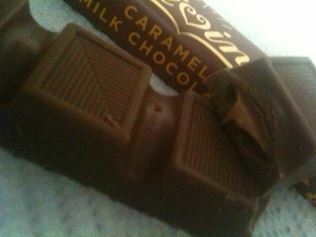 I found that I was taking a square, biting off the bottom and then licking out the caramel. I’d buy that caramel by the jar if I could! I just cannot get over how absolutely smooth, buttery and delicious it is! 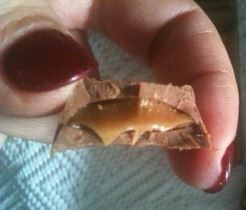 No wonder Green & Blacks withdrew their caramel bar. One taste of this bar and any other caramel just fades into insignificance. The balance of the buttery caramel with the milk chocolate is absolutely perfect. The caramel can stand on its own as can the milk chocolate but the sum of the individual parts is not equal to the whole. As a bar this is absolutely delicious and I cannot wait to buy some more! One of the best things about this caramel (and this chocolate) is that it is entirely and completely PALM OIL FREE. No need to sign up to the roundtable on sustainable palm oil production – this is better for the environment out of the box. Choose this chocolate not only because it is palm oil free and not only because it is farmer owned and helps women out of poverty but because it tastes awesome. Makes it easy to be ethical, hunh?